Wheatacre Hall Barns01502 677208work Self-cateringAmidst the beautiful south Norfolk countryside under wide arching skies amongst farmland and hidden waterways, eight luxury Norfolk holiday cottages can be found. All eight barns have been sympathetically converted into modern luxury accommodation. Each barn boasts its own private sitting out area and access to the farm grounds where fishing and farm walks, cycling and bird watching as well as the enjoyment of a hot tub combine to make Wheatacre Hall Barns the perfect place for a luxury holiday where you can relax and unwind. Swimming is also included at a nearby heated pool. Wheatacre Hall Barns offers weekly bookings starting on Friday and sometimes short breaks. 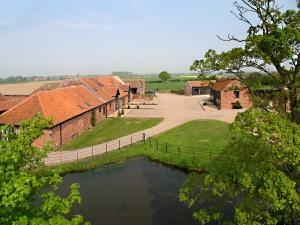 Converted barns sleeps up to 6 + cot in 3 bedrooms. Family bathroom. Ground floor WC, shower room, Open plan kitchen/diner/lounge. Fully equipped kitchen. open all year. Weekly lets from Friday or Monday. Short breaks available Fri - Mon or Mon - Fri.
Snipe offers weekly bookings starting on Friday and sometimes short breaks. Large converted barns sleeps up to 6 + cot in 3 bedrooms. 1 en-suite, family bathroom. Ground floor WC, shower room, large open plan kitchen/diner/lounge. Fully equipped kitchen. open all year. Teal offers weekly bookings starting on Friday and sometimes short breaks. Widgeon offers weekly bookings starting on Friday and sometimes short breaks. Woodcock offers weekly bookings starting on Friday and sometimes short breaks. 'Our cottage was simply outstanding and one of the most luxurious retreats we have ever stayed in. The blend of contemporary and traditional was just right and the furnishings were top quality - this was far more than a home-from-home! The facilities on-site are fantastic and we were made to feel completely at home during our stay.' Lorraine Spicer-Leigh. Cycle storage available. Free swimming in nearby heated pool. Soft play barn, fitness barn. Hot tub, games rooms onsite. Children welcome from any age. Approx 5 miiles from the market town of Beccles, 20 minutes by car from Great Yarmouth and Lowestoft and 30 minutes form Norwich. Full direction on website. Rail stations with nearby public transport links are at Beccles and Haddiscoe. Beccles is on the Lowestoft/Ipswich line. Haddiscoe is on the Great Yarmouth/Norwich line. Take bus from Beccles or Haddiscoe and then local route to Wheatacre, stopping on White Lion Road. From here it is approx 10 min walk.